I was having a lazy Saturday morning, reading through the newspapers at my favourite coffee shop in Doncaster. 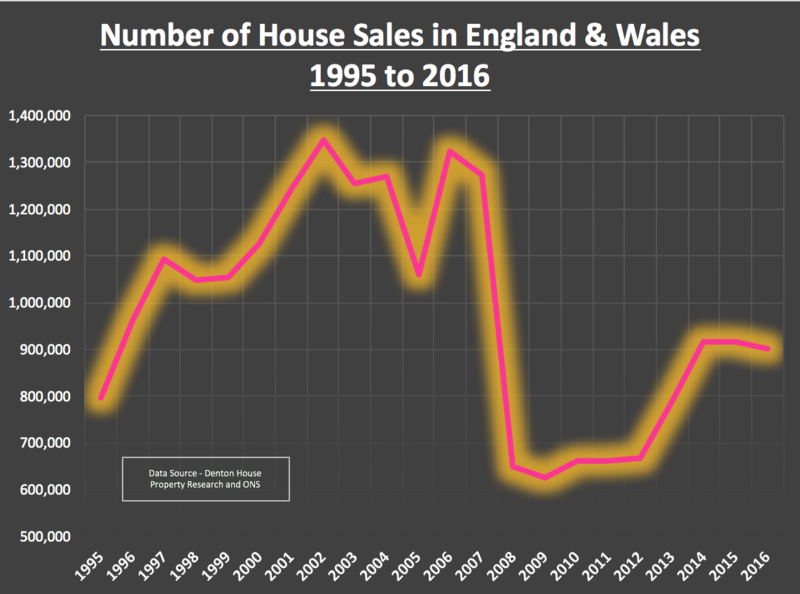 I find the most interesting bits are their commentaries on the British Housing Market. Some talk about property prices, whilst others discuss the younger generation grappling to get a foot-hold on the property ladder with difficulties of saving up for the deposit. Others feature articles about the severe lack of new homes being built (which is especially true in Doncaster!). A group of people that don’t often get any column inches however are those existing homeowners who can’t move! What does thistranslate to in pure numbers locally? 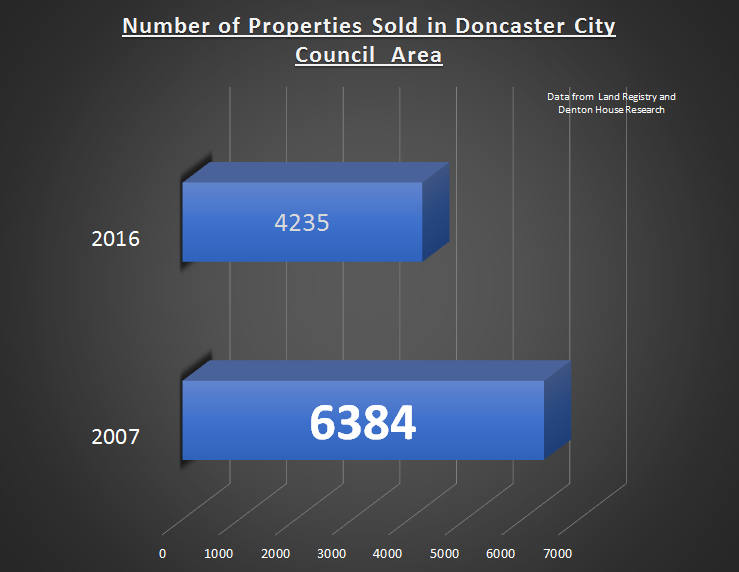 In 2007, 6,384 properties sold in the Doncaster City Council area and last year, in 2016 only 4,235 properties sold – a drop of 33.66%. Therefore, we have just over 2,150 less households moving in the Doncaster and surrounding Council area each year. Now of that number, it is recognised throughout the property industry around fourth fifths of them are homeowners with a mortgage. That means there are around 1,762 mortgaged households a year (fourth fifths of the figure of 2,150) in the Doncaster and surrounding council area that would have moved 10 years ago, but won’t this year. There are around 634 households a year that aren’t moving due to a fall in the number of mortgaged owner occupiers (e. demographics). I then estimate another 247 households a year are of the older generation mortgaged owner occupiers. As they are increasingly getting older, older people don’t tend to move, regardless of what is happening to the property market (e. lifestyle). Then, I estimate 106 households of our Doncaster (and surrounding area) annual non-movers will mirror the rising number of high equity owner occupiers, who previously would have moved with a mortgage but now move as cash buyers (e. high house price growth). I believe there are 775 Doncaster (and surrounding area) mortgaged homeowners that are unable to move because of the financing of the new mortgage or keeping within the new rules of mortgage affordability that came into play in 2014 (e. mortgage). The first three above are beyond the Government or Bank of England control. However could there be some influence exerted to help the non-movers because of financing the new mortgage and keeping within the new rules of mortgage affordability? If Doncaster property values were lower, this would decrease the size of each step up the property ladder. This would mean the opportunity cost of increasing their mortgage would reduce (i.e. opportunity cost = the step up in their mortgage payments between their existing and future new mortgage) and they would be able to move to more upmarket properties. Moving to a bigger home is something Doncaster people with growing young families aspire to. Many people in two bedroom homes move to a three-bedroom home and some even make the jump to a four-bed home. Bigger homes, especially three-bed Doncaster homes are much in demand and it can be a costly move. If you live in Doncaster in a two-bedroom property and wish to move to a four-bedroom house in Doncaster, you would need to spend an additional £152,424 (or £602.08 pm in mortgage payments (based on the UK Bank average standard variable rate)). However, going straight to a four bed from a two-bed home is quite rare as most people jump from a two to three-bedroom home, then later in life, from a three to four-bedroom home. So, after being asked my thoughts on moving home in Doncaster by a friend recently, please find my analysis of the local property market and then some thoughts. 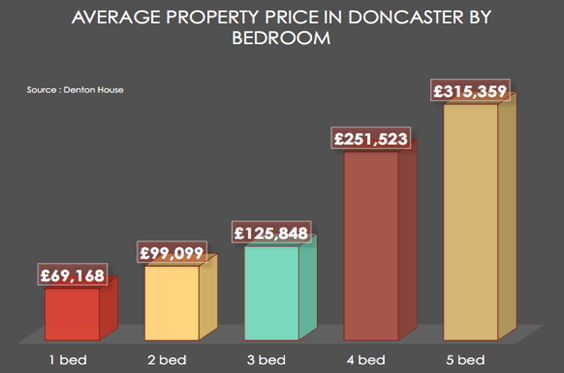 To start with, let us see what the average property price is for a Doncaster property by the number of bedrooms it has. There are some interesting jumps in costs when moving upmarket as a Doncaster buyer. 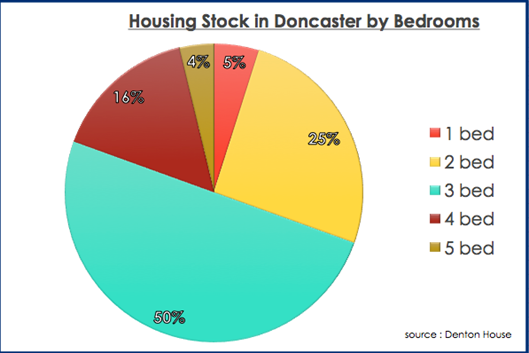 The cost of moving from one to two beds, and two to three beds is relatively reasonable, whilst the jump from three to four beds in Doncaster is quite high (and hence why some four bed properties are taking slightly longer to sell nowadays). On an aside, a lesson here for all my landlord property blog readers, you can quite clearly see why the larger 4 and 5 bed properties don’t offer the best returns for buy to let because the monthly finance costs and rents achieved don’t match up so well (i.e. A mortgage for a 4 bed home in Doncaster would cost you 99.86% compared to a 3 bed mortgage, but the jump in rent would be a lot less than that – although depending on your circumstances, 4 bed homes can offer other advantages to buy to let – pick up the phone if you want to know what they are in more detail). The most active purchasers are 20 something and 30 something home-owning parents with growing families. Many look to more modern developments for the perfect balance of access to decent primary schools, commutability and lifestyle. For landlords looking to buy within Doncaster, they face stiff competition from these 20/30 something families, making the three bedroom Doncaster home massively in demand, often attracting spirited offers and selling within weeks of listing. This mix of homebuyers and landlords is a pressure point in the Doncaster property market. Again, if you are a landlord, call me and I will show you areas with decent returns where you aren’t in so much competition with young Doncaster family homebuyers. Yet, the cost of an additional bedroom can be too much for some Doncaster buyers. 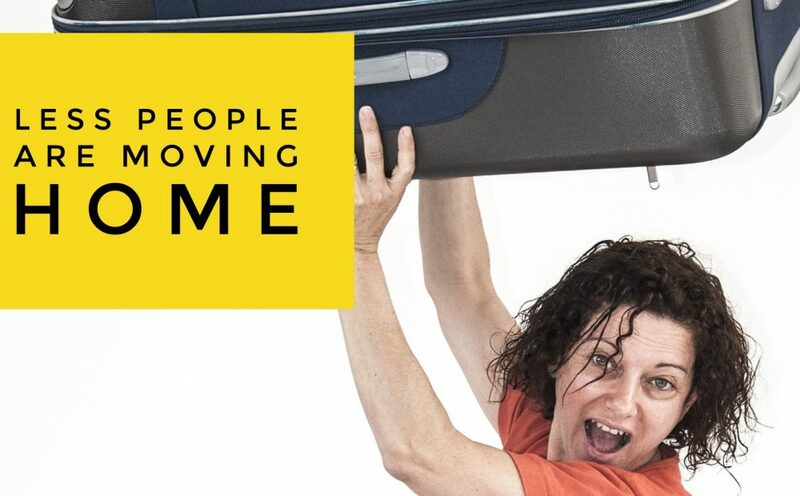 It is quite challenging moving home the first time, but to then find you are priced out on the next move up the ladder can be quite disconcerting, with families often having to move to a different part of town to get the bigger home they need. 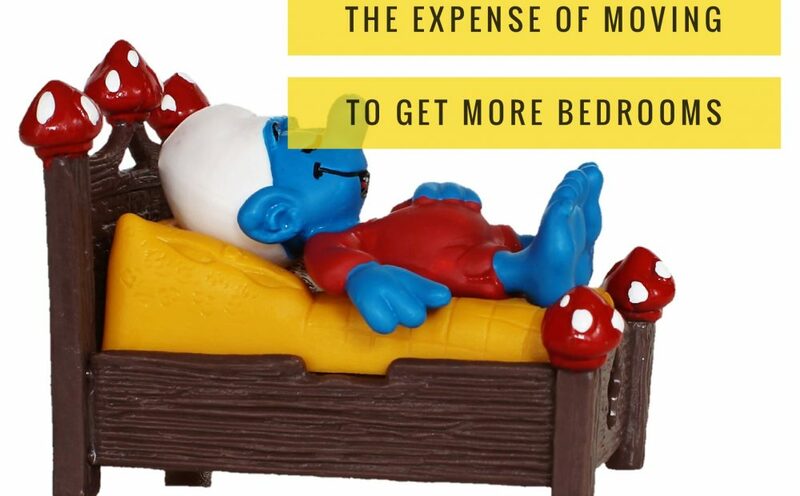 Nevertheless, that’s the place many homeowners find themselves in with the cost of the additional bedroom being too much to bear. To those buying their home for the first time, all I suggest is they not only consider the mortgage payments and other costs of their first home, but also do their homework into their next rung up the Doncaster property ladder. Thinking about it now will keep you ahead of the game in the future; as your number of bedrooms, family property needs and lifestyle wants change. ..and Doncaster landlords – well these changes in the way people live also mean there are opportunities to be had in the Doncaster rental market. Many Doncaster landlords are starting to pick my brain on this, so if you don’t want to miss out – drop me a line. 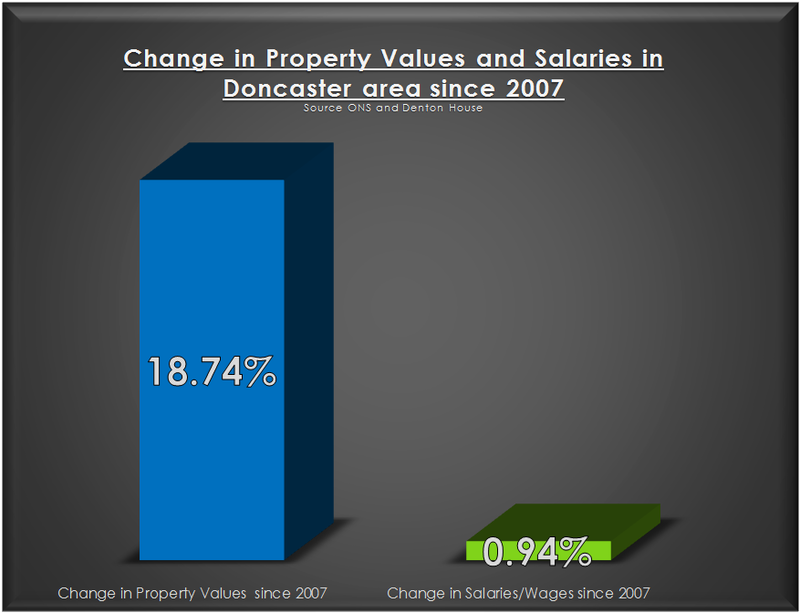 Doncaster Buy-to-Let Return / Yields – 2.5% to 8.7% a year. The mind-set and tactics you employ to buy your first Doncaster buy to let property needs to be different to the tactics and methodology of buying a home for yourself to live in. 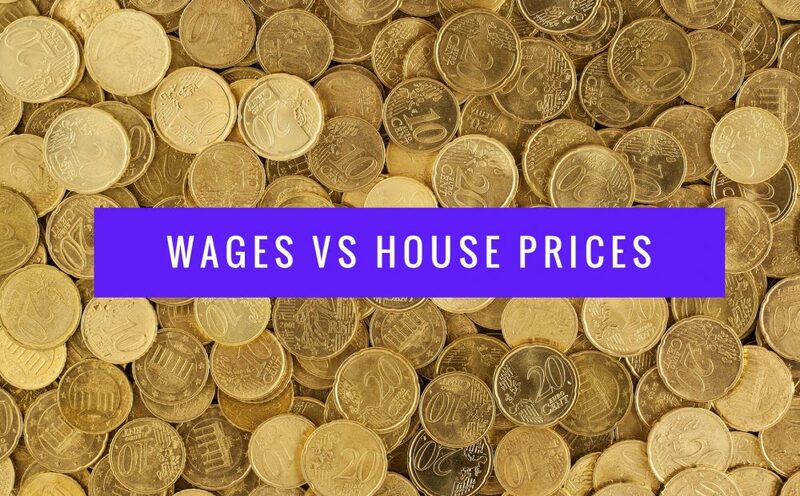 The main difference is when purchasing your own property, you may well pay a little more to get the home you (and your family) want, and are less likely to compromise. When buying for your own use, it is only human nature you will want the best, so that quite often it is at the top end of your budget (because as my parents always used to tell me – you get what you pay for in this world!). 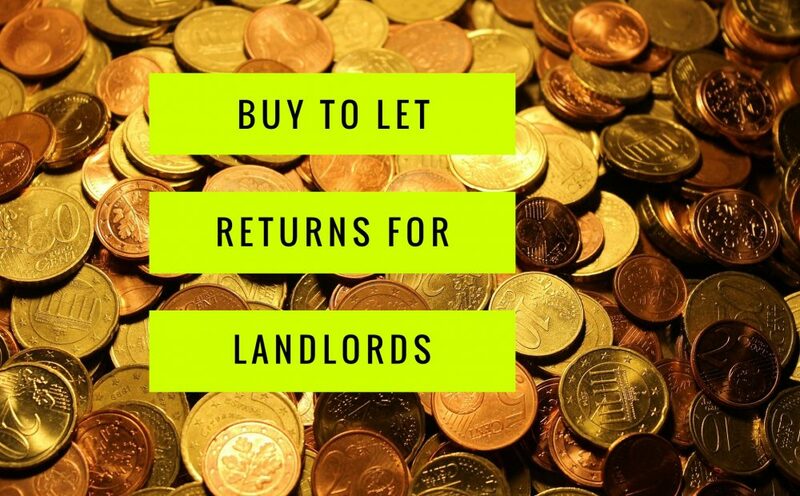 Yet with a buy to let property, if your goal is a higher rental return – a higher price doesn’t always equate to higher monthly returns – in fact quite the opposite. Inexpensive Doncaster properties can bring in bigger monthly returns. Most landlords use the phrase ‘yield’ instead of monthly return. To calculate the yield on a buy to let property one basically takes the monthly rent, multiplies it by 12 to get the annual rent and then divides it by the value of the property. This means, if one increases the value of the property using this calculation, the subsequent yield drops. Or to put it another way, if a Doncaster buy to let landlord has the decision of two properties that create the same amount of monthly rent, the landlord can increase their rental yield by selecting the lower priced property. 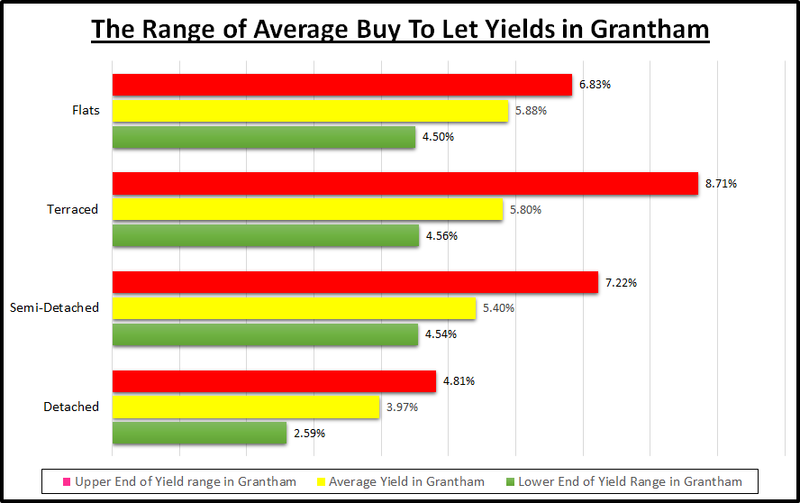 Now of course these are averages and there will always be properties outside the lower and upper ranges in yields: they are a fair representation of the gross yields you can expect in the Doncaster area. However, before everyone in Doncaster starts selling their upmarket properties and buying cheap ones, yield isn’t the only factor when deciding on what Doncaster buy to let property to buy. Void periods (i.e. the time when there isn’t a tenant in the property between tenancies) are an important factor and those properties at the cheaper end of the rental spectrum can suffer higher void periods too. Apartments can also have service charges and ground rents that aren’t accounted for in these gross yields. Landlords can also make money if the value of the property goes up and for those Doncaster landlords who are looking for capital growth, an altered investment strategy may be required. 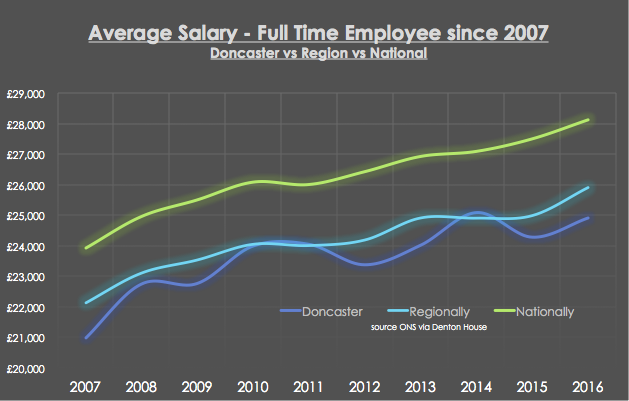 It is very much a balancing act of yield, capital growth and void periods when buying in Doncaster. Every landlord’s investment strategy is unique to them. If you would like a fresh pair of eyes to look at your portfolio, be you a private landlord that doesn’t use a letting agent or a landlord that uses one of my competitors – then feel free to drop in and let’s have a chat. What have you got to lose? 30 minutes and my tea making skills are legendary!